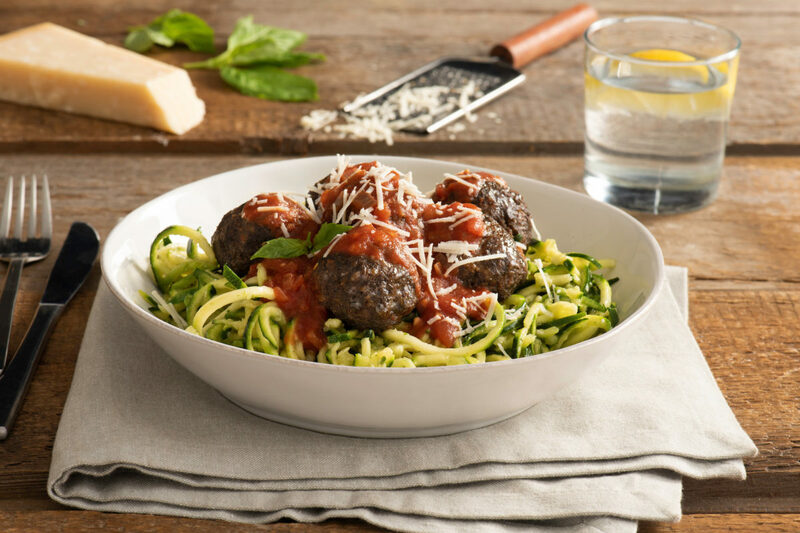 These moist and tender meatballs are made with ground beef and ground mushrooms, then spiked with Better Than Bouillon® Roasted Beef Base for rich flavor. Heat oil in Dutch oven or large saucepan set over medium heat; cook onion, garlic, salt and pepper for 3 to 5 minutes or until tender. Pour in tomatoes, beef base and bay leaf; bring to boil. Reduce heat to low. Simmer for 15 to 20 minutes or until thickened slightly. Meanwhile, preheat oven to 400°F. In food processor, grind mushrooms until very finely chopped; transfer to large bowl. Mix in ground beef, bread crumbs, egg, 2 tbsp Parmesan, 1 tbsp beef base, olive oil, garlic, oregano, red pepper flakes and pepper. Roll into 1-inch meatballs. Arrange in single layer on parchment paper–lined baking sheet. Bake for 12 to 15 minutes or until cooked through. Stir meatballs into sauce; simmer for 10 to 15 minutes or until soft and tender. Stir in basil. Meanwhile, cook spaghetti according to package directions in boiling water seasoned with remaining beef base; drain, reserving 1/3 cup cooking water. Toss together spaghetti, cooking water and 1 1/2 cups sauce until well coated. Divide spaghetti among 4 plates; top with meatballs, and extra sauce if desired. Serve with remaining Parmesan cheese.